Some personal insights by Seán Conlan. Brian Davey’s reflections on the conference are available , while Willi Kiefel’s paper on Richard Douthwaite’s legacy, which was presented at the conference, is here. The following notes are intended to give some personal insights into what was a very special event, the fourth in a series, (Paris 2008, Barcelona 2010,Venice 2012) and, while it followed the process of previous degrowth conferences, it was by far the most adventurous to be attempted to date. The event was marked by a diversity of individuals, groups and organisations, which helped to create an atmosphere of real creativity, development and movement. Approximately 3000 delegates attended and one of the most striking aspects was the ease of interaction of the participants with each other. Leipzig itself gave a unique backdrop. The conference main venue was Leipzig University, which is in the heart of the city, and only a stone’s throw from St. Nicholas Church (Nikolaikirche) – centre of peaceful revolt against communist rule in 1989, which was the trigger for major political and societal transformation throughout Europe. A feature of the event was the disarming informality among participants and organisers alike which perhaps reflected their youthfulness and energy. Interspersed with this youthfulness was a good cohort of senior academics, and activists. It was also striking that a large proportion of the participants was female – with a striking and powerful sense of values. Official organisers of the conference were the University of Leipzig, DFG-Research Group Postwachsumsgesellschaften (a research group of the University of Jena), Förderverein Wachstumswende e.V. (a German network on degrowth), Konzeptwerk Neue Ökonomie (a Leipzig-based think-tank for a social and ecological economy) and Research & Degrowth Network (founders of the degrowth conferences). They were ‘supported’ by a large number of other organisations of all types. Degrowth is a movement built around a critique of the growth economy, which draws strongly on the limits to growth (cf also The Growth Illusion of Richard Douthwaite) and strong sustainability debates of the 1970s. The underlying premise is that continuous economic growth is ecologically unsound, economically unsustainable, and it is no longer improving social welfare and happiness (Jackson, 2011). See http://www.degrowth.org/framingdegrowth. One of the first steps of the conference was to explore exactly what is meant by ‘degrowth’. access to rented bicycles (1€! ); CO2 Travel Emissions due to travelling to the conference are compensated and by the Selbach Environmental Foundation. In addition, music, art and science were intermingled in a pervasive spirit of volunteerism – coordinated by a special ‘volunteer coordination team’ – which was in its own way revolutionary. In all, a total of about 20 groups each of approximately 30 people worked through action plans and delivered their results at the closing plenary session. As well as exhibitions, stalls and discussion areas, Open Space sessions were also a key part of the activities each day, and the conference was also taken into the heart of the consumer areas of Leipzig with a World Café event. The overall structure consisted of an introductory day, 3 Themed days and a final (closing day). The introductory sessions focused on the principles/basis of degrowth, which was useful for those who had not attended previous degrowth conferences. Literally hundreds of parallel sessions, workshops, discussions, artistic events, exhibitions, films, excursions and special (informal and formal) sessions took place. I have never attended a conference where a packed plenary session was still ongoing at 10.30 pm – or where the opening session had overflowed into 4 additional theatres. It was impossible to attend even a small proportion of all the activities, or to attempt to summarise the inputs, however there was an over-riding sense of profound yearning for a new society based on emerging values. In the first contribution Hans scanned the most important scientific aspects of Richard’s work and described how the extent his work can be seen as a convincing foundation for a degrowth strategy. Hans also described how this foundation can be used to develop practical suggestions towards the political realization of the strategy. He particularly showed how the acceptance of these basic convictions would mean working on a comprehensive transformation of the economy both in theory and in practice, especially concerning the monetary and the financial systems. The second contribution described the breadth and depth of Richard’s contribution and legacy in Ireland. Willi described how the preparation of the paper had involved working with a team from Feasta, and inviting individuals who had known Richard to describe how he had impacted on them. Willi charted the background to Richard’s arrival in Ireland, the birth of Feasta (Foundation for the Economics of Sustainability) – which Willi described as Richard’s ‘alter-ego’. He also cited the richness of Richard’s work, his various publications, lecture series, contributions and submissions. In particular, it was striking how Richard’s influence enabled a rich diversity of contacts and activities both in Ireland and abroad. Willi concluded by citing some of the large number of individuals who had been influenced by Richard. Third Contribution: Local renewable energy systems in the Czech republic – the case of the Centre for Application of Renewable Energy (CARE) in Vilémov – Roman Juriga. Roman described the context for the establishment of this Centre for Renewable Energy in Vilémov, which was triggered by contact between himself and Richard. The Centre uses a broad range of renewable energy sources to provide a comfortable and affordable environment for social accommodation in a rural environment. The session concluded with a question and answer session, and a brief discussion of the possible future platforms for deploying degrowth linked to the work of Richard. 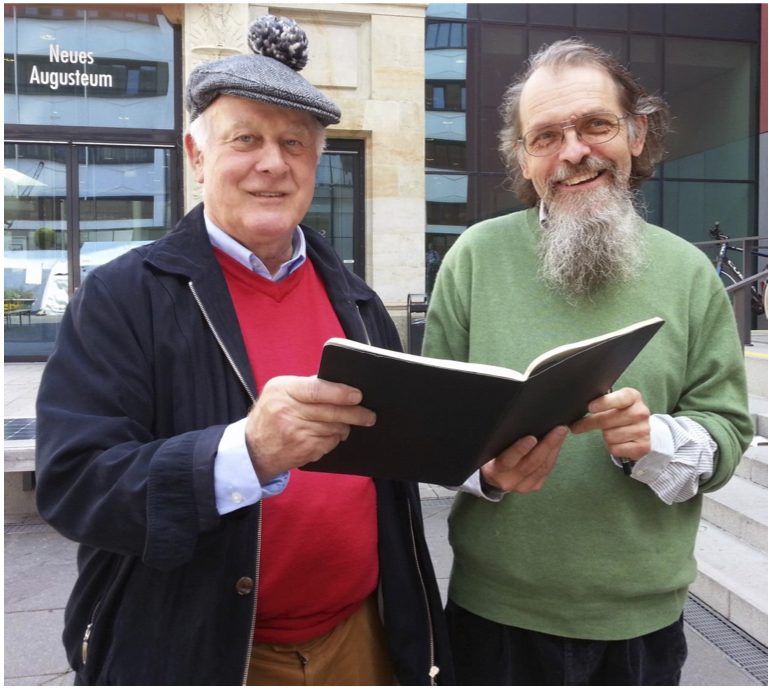 Willi Kiefel and Prof. Hans Diefenbacher discussing their contributions at Leipzig. Degrowth firmly challenges all the economic paradigms of not just growth, but austerity and many of the basic assumptions of capitalism itself. It was truly refreshing therefore, to assist in a creative, experimental event based on living and practising the principles the organisers preach. Of the many interventions, one of the most notable was the call from Sunita Narain (CSE India) who highlighted the immense challenges of India in addressing the growing needs of the poor while still remaining within planetary boundaries. In highlighting a range of issues from climate change – ‘the Monsoon is the Finance Minister’ – to energy provision for all, she appealed for new transformational trajectories of economic development for the poor and the rich. At the time of writing this short description of the Leipzig Degrowth conference, it is very striking that many in Ireland have gone into a self-congratulatory mode of returning to Celtic Tiger growth rates. What a contrast to the spirit of enquiry, creativity, and values of degrowth in Leipzig!